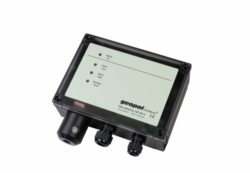 The GP-SA-2 stand-alone detector continuously monitors the gas concentration, in the range of 0-100% LEL (lower explosion limit) or in the range from 0 to 40,000 ppm for e.g. refrigeration gases. The "service button" is used to prevent alarms to be transmitted to the external system to stop the system by e.g. calibration, service and refill of coolant.